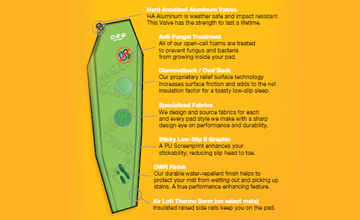 According to Pacific Outdoor Equipment (a small outdoor company located in Bozeman, Montana that specializes in innovative gear built from welded fabrics for human powered sports), the correct sleeping mat is chosen after considering “the right insulation for the seasons, the right length for you, the right gender, and of course the right amount of weight savings or cush.” Without considering these attributes, you are putting yourself at the mercy of the weaker link. Therefore, sleeping pad selection is of utmost importance if you wish to get a good night’s sleep while out on your travels. In this article I set out to review the Peak Oyl Elite sleeping pad from Pacific Outdoor Equipment and to give you my assessment of this specific pad after having slept on it for a solid 40+ nights. MODELS: First and foremost, you should know that I was sent the 2009 edition of this sleeping pad to review, which at the time was called the Peak Oyl Aero Mtn. In 2010, the name of the pad was changed to the Peak Oyl Elite. It is the same pad, but with a slightly different color and a slightly different name. Everything else, however, remains almost exactly the same. SIZES: The Peak Oyl Elite is a 4-season sleeping pad that comes in 5 different sizes: 3 for men (long, regular and 2/3) and 2 for women (regular and petite). The pad reviewed in this article is a men’s regular. Unfolded, the pad measures 20 inches wide (51cm), 72 inches long (13cm) and 1.5 inches tall (2.5cm) with berms that are 2 inches thick and are positioned at the left and right edge of the pad to prevent you from rolling off while you sleep. SHAPE: The pad is designed with a traditional dummy shape built to match that of sleeping bags of the same size and shape. This helps to reduce pack weight and is ideal for use with mummy shaped bivy sacks. FIRST IMPRESSIONS: On first inspection, the Peak Oyl Elite sleeping pad is small, compact and relatively lightweight (All of which are good things to see in a quality sleeping pad). Inside its stuff sack, the Peak Oyl Elite measures approximately 11 inches long (28cm), 6.25 inches wide (16cm) and 6.25 inches tall. Considerably heavier than its sister mat, the Peal Oyl Lite, this compact air mattresses weights in at 785 grams (27oz). However, it should be noted that the Elite is heavier than its sister pad (the Peak Oyl Lite) because it has added material used in its construction so as to transform the design from a 3-season pad to a 4-season pad. QUALITY: After removing the pad from its stuff sack, I can instantly tell that it is a quality pad. The material is lightweight, but thick. “I don’t think I can easily tear or puncture this,” I recall thinking to myself. After 40 nights of use, the pad looks as though it were brand new. The valve at the top of the pad works as it should and no air has leaked out while I’ve been sleeping. EASY INFLATION: The pad is self-inflating and works just as it should. A couple extra puffs in the valve gets the pad to your desired inflation level. BIG & TALL? Even though I measure over 6 feet tall, I fit on the pad perfectly. The bermed side rails help to keep me inside the mat while I move about and the sticky S-curve grip trail that runs down the center of the pad helps to keep my sleeping bag from sliding off the pad in the middle of the night. EXTRAS: Each pad comes with a stuff sack, strap and repair kit. OVERALL IMPRESSION: Overall, the Pacific Outdoor Equipment Peak Oyl Elite sleeping pad is one fantastic product. In fact, it is quite possibly the best sleeping mat I have ever used… and I would highly recommend it. DRAWBACKS: My only criticism for this specific pad is that I have a hard time getting it back into its stuff sack in the morning. While this is obviously not nearly as important as the warmth and cushion the pad is meant to provide, being unable to easily get the pad back into its stuff sack is one feature that I find to be incredibly important. It may be the pad’s self-inflating nature or the shape of the pad itself that makes folding it back up so difficult. Whatever the case, I’ve found that even with warm hands and a rested body, it can be difficult to get the pad back inside its stuff sack. Under different conditions (i.e. camping in the cold, snow or rain) I could see folding the pad back up to quite a nuisance. SUMMARY: In the end, the Peak Oyl Elite is a serious sleeping pad for serious outdoor adventurers. If you want a mat that does what it is designed to do (keep you warm and comfortable no matter what time of year you hit the road) and you want a sleeping pad that will last you a very long time, then this is one sleeping pad I am proud to recommend. 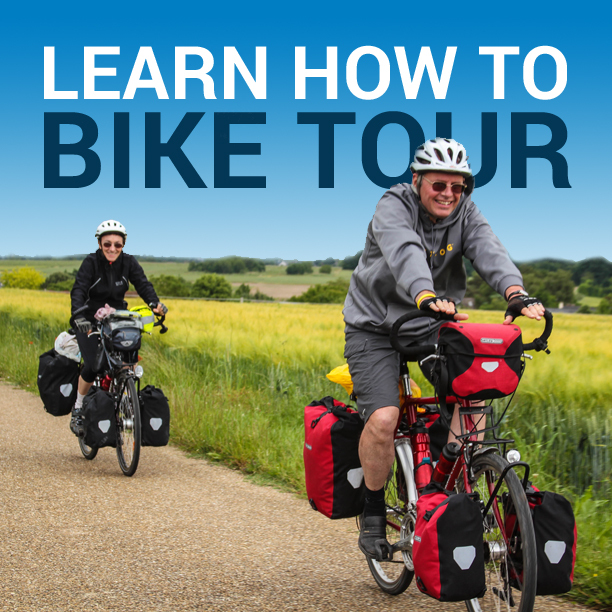 Review Status: This product was sent to Bicycle Touring Pro for review purposes and was obtained at no cost. This entry was posted in Bicycle Touring Pro Articles, Main Articles, Product & Service Reviews, Products, Sleeping Pads and tagged 4 season sleeping pads, bozeman, enviromental sleeping mats, green sleeping pad, montana, pacific outdoor equipment, pacific outdoors, peak oil sleeping pad, peak oyl aero, self inflating sleeping pads, sleeping mats, sleeping pad review, sleeping pads. Darren, how does the Peak Oyl Elite preform after a year? Do you still like it? And would you still recommend it? Well, I’ve surely had the pad for over a year now, but I haven’t slept on it every night. I’ve probably only used it 60 nights in total. But based on those 60 some odd days, the thing in still fantastic. It looks and feels as though it were brand new… and except for the Exped sleeping mat (which I also highly recommend), it is one of the few sleeping mats I feel EXTREMELY confident in telling others about. Nice review, although I would like to point out that palm oil is not environmental friendly in anyway, so dont get tricked into thinking you’re doing something good for the environment. Look in the Amazon and tropical Asia where they cut down large areas of rainforest to get room for oil palm plantation. Thats a one-way process, and its really hard to turn it back into rainforest again. You are right Bjorn. The Palm Oil used to make this sleeping pad is not the best solution, but I do think it is a step up from the oil that most of the industry uses in the creation of their products. Even Pacific Outdoor Equipment says that palm oil is not the solution – but at least a step in the right direction. Anyway, I am now a owner of one of these pads, havent tried it yet, so really looking forward to it. Is it usable all year round, or is it too warm in summer? Maybe complement it with a cooler sleeping bag? Another question is if you/anyone have tried it with thermarest trekker chair? I have just discovered your website and I loved your writings on South Africa. My home country. However, I’m writing to ask if Pacoutdoor is still in business or what? I clicked on the link you gave, and it’s a domain name registration site. Just wondering.